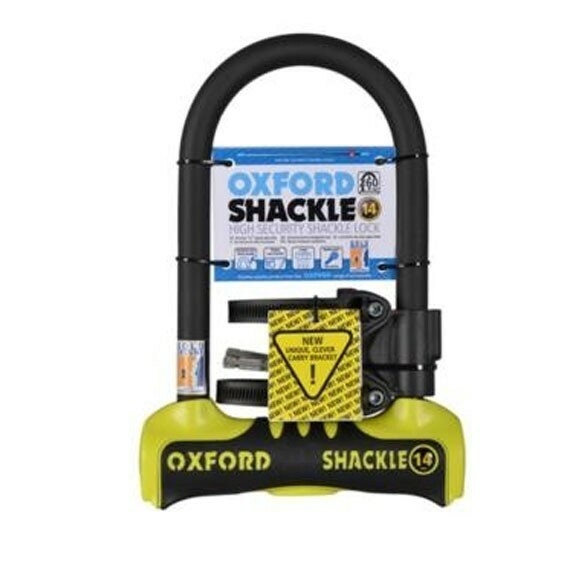 Oxford's SHACKLE 14 D-Lock fulfills the three most important requirements of a quality D-Lock: Highly secure: it comfortably surpasses Sold Secure 'Gold' standard by using a 14mm special hardened steel shackle and body mated to a simple but powerful locking mechanism with 3 replaceable keys. Easy to transport: Oxford devised a unique quick-release carry bracket which is both sturdy and super-easy to fit to a huge range of frame and seat post sizes. Reliable: a top quality pre-oiled locking mechanism is protected by a rubber over-moulded body to cope with the tough outdoor life that locks endure. The lock comes in 2 sizes; the 260mm length is a good compromise for general use, while the largest 320mm should be big enough to encompass the wheel, frame and some street furniture. This model can also be purchased with a chunky 1.8m hawser cable, to extend its reach.